Want to know what it’s like to live inside a dream? 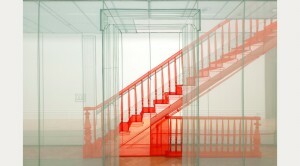 The installation art of Do Ho Suh provides a lovely metaphor for the ways we carry our notions of home and hearth, and how a place, or even a country, imprints until it becomes part of us. Suh recreates these totems most strikingly in his life-size representation of the rooms of an apartment/studio he once inhabited in New York’s Chelsea neighborhood. From the radiators to the crown moldings, the gossamer details (rendered from floor to ceiling in colored translucent fabric) float like ghosts; after this show, you won’t look at your own walls with quite the same indifference, proof again how art can transform the everyday to something akin to exaltation.